Burning Man. Not just a party in the desert. Not just a social experiment. Would I do it again? You bet. A lot. Til I'm on my death bed. I could always say more, but some of it gets to simply stay with me. Here is my final and very disjointed recap of my big, bad birthday present to myself ... the good, the bad and the stupendous. Back aches and neck cricks from loving on so many people at Barbie Day Spa. Not enough olive brine for my dirty martini. A situation where someone drank too much and got a little douchey. The frustration of having to take the time to address it and then build healthy boundaries. The first three minutes on my bike. Always. Every single time I got on it. Calves on fire, and I always, always, ALWAYS hit soft, thick sand and came to an immediate stop, while my body (sometimes) flew off. At the four minute mark, I was a cycling rock star and owned those miniscule dunes. My body's need for a decent night's sleep. I did not deny myself this, so it meant making a deliberate choice to not stay up all night ... every night. Putting in my contacts every day. I either had residual from a baby wipe or playa dust on my hands and fingers. Both burn your eyes like fire. It was always a race to rinse my hands with water before dust had time to stick to them. The handful of cranky people when I was feeling uber happy and joyful. The tens of thousands of uber happy and joyful people when I was feeling cranky. Having to pee in the middle of the night. 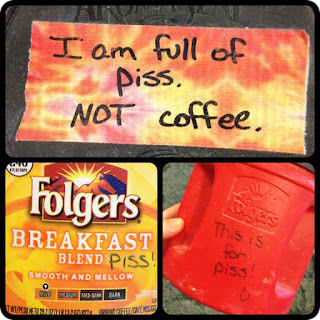 This always required hovering over my piss bucket and praying to Peter, Paul and Ringo that I didn't accidentally knock it over on my sleeping bag. **an aside: if it were not for the amazing suggestion of a perfect piss bucket, this experience would've been exponentially worse - thanks to my burner buddies over at Technomadia. Having to poop in the middle of the night, which required putting on the least amount of clothing possible while still not freezing your tukus off, always putting on socks and lacing up your dusty *&%#! boots (so your feet would be clean when you finally crawled back into bed) and then hiking a block to the porta potties. One night when I really did not feel very well at all. It lasted about four hours. I absolutely did it to myself and pushed too hard. I did not care for that. Lesson learned. A roller rink in the middle of the desert, finding a pair of skates that fit and had purple laces! Hooping while roller skating. Watching a guy follow behind me with an electric screwdriver, tightening screws on the roller rink floor. Gifting hand and foot massages to a really relaxed, fun couple, Adam and Grizz. They didn't do or say anything particularly spectacular, but they were easy. Easy to get to know. Easy to connect with. Fun and full of laughter, and genuinely enjoyed getting to know everyone around them. Gifting a foot soak to a woman from Berlin. Using her own vegan nail polish to paint her nails. Then waiting while she dug through her backpack to find and gift me a lighter that reads "Berlin loves you." "I want you to remember our lovely conversation today anytime you see this. I will think of you each time I wear this polish." 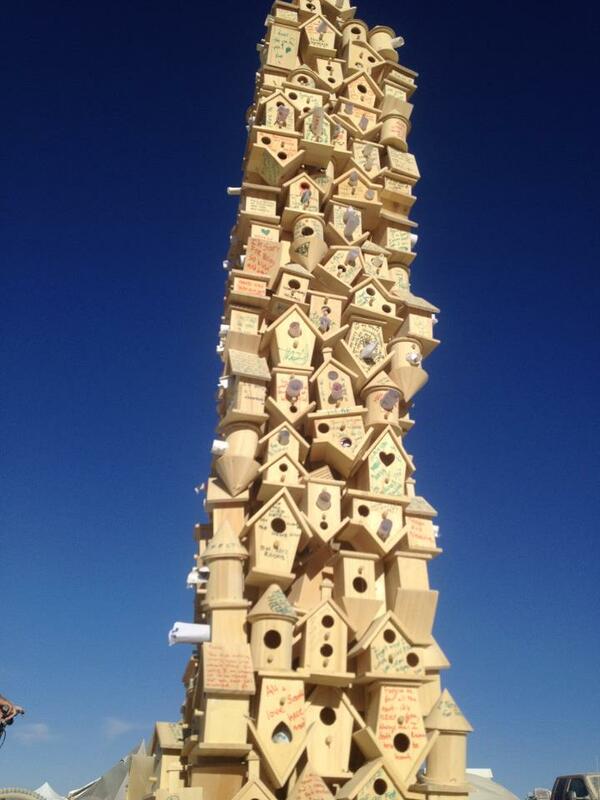 Ringing the bell (something all virgins are welcome to do), declaring myself a citizen of Black Rock City. Lying down and becoming one with the playa dust. Getting "branded" along the way to whatever else I was planning to do. Ya' know, because there was a camp that was "branding" people. And the lady with the brands was super happy and loud. Sooooo, it'd be stupid not to. My friend, Temporary, actually (for realsies) getting the Man branded on his chest. For realsies. Standing at a smaller burn, knowing my friend's ashes were included. I'm sure my face (and oodles of tears) made my giant feelings very obvious. Hearing a very kind voice ask, "May I hug you?" I accepted, and received a very thoughtful embrace. "What are you feeling?" I explained the loss of my friend and how he died. Didn't expect to feel as overwhelmed as I was, by the sight of the fire. This complete stranger asked me questions about my friend and created a space for me to grieve for a few minutes. J was exactly what I needed at that very moment. 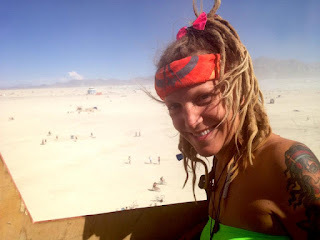 We swapped camp info, but as normally happens on the playa, neither of us expected to see each other again. Talking bladder issues and menopause with a wonderful woman in her 60's, and us both finding ourselves laughing and feeling deeply connected over how we pee. Then showing off my pStyle (no, not actually demonstrating) to her while everyone around ooo'd and ahhh'd. Same woman was a part of our village. The night the Man burned, she never let my mug be without champagne. 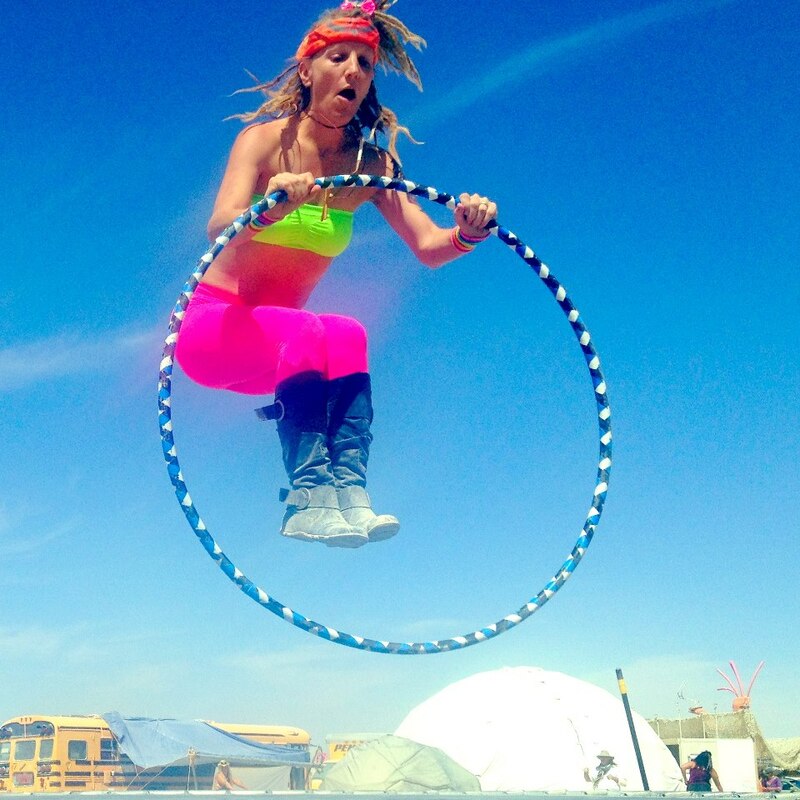 Chased me around in between hooping. Always overfilled it so I had to lick the bubbles off my hands. We'd giggle and laugh and her bright little wig would wobble all over the place. Randomly running into Adam and Griz along a street somewhere. They noticed the hoops my friend and I were carrying. We stopped in the middle of the street and showed them a little hoop love. That is when we discovered Griz spins fire poi. My friend, Jamie, has always wanted to but simply hadn't had the opportunity yet. Plans were made, quickly, as they are: "We are at such-and-such camp and we will be there tomorrow night at such-and-such time." Which could be exact or we may never, ever see them again. Climbing a few stories onto a lit-up, booming, glowing dance camp and hooping with my LED, looking out over the other 399 parties going on. The journey to find a friend-of-a-friend whose camp was not listed publicly. Finding a trampoline. Attempting to hoop on said trampoline. Looking at the dry erase board next to the trampoline and seeing a map where people could write in unpublished camp names. There was the friend's camp! Just what we were looking for! That friend-of-a-friend is now simply "a friend." He made me my very first Ramos Fizz. I'm a fan. "Hey, Christine, I'm gonna' hang out across the street for awhile, and play some Ms. PacMan." Because, ya' know, there was a full-sized arcade game just across from our village, right next to the telephone where you could record a message to yourself which would be delivered back to you, via email, sometime in the future. Riding or walking and seeing 37 different things every 60 seconds. Looking up while working at the Day Spa, and seeing J walk in. He had written enough info on his arm in Sharpie the night before. Found me. I was able to give him a foot wash and massage, and visit for a long time - pour some love back into him after he created such a beautiful space for me the previous evening. The big glass Buddha who would answer any of your yes-or-no questions, in magic eight ball fashion. Glowing at night with swirls at each chakra. Even cooler was the awesome guy sitting with the Buddha who talked with us for quite a while and told us his story. Showing up to Adam and Griz's camp and they were there as we had hoped! Their village was having a wine tasting. One of their camp mates had smuggled in pate from France (stashed within socks within shoes in his suitcase). It was amazing. And then, this happened. Marching band throw down at Center Camp. Eating more steak in one week than I've had in two years (that would = two small pieces). "Hitting the wall." Everyone hits the wall at some point out there. It's different for every person, but eventually you either have a point of physical exhaustion or emotional depletion. Yours may last minutes. Mine lasted about seven hours. I stood up at the Day Spa at 3:45 (we "closed" at 4:00) and said, "I want to invite all of you to use everything we have here. Wash one another's feet. Paint nails. Whatever you would like. If I do it for one more second, I'm going to start crying again. And that would just be bad and wrong. Thank you for understanding." Or something like that. I hit my wall, and had camped there for way too many hours. So, I went and did some self care and kicked it to the wind. And, no, I did not list this in the wrong category. While it was rough and miserable, I loved it. Everyone hits the wall, especially their first year. 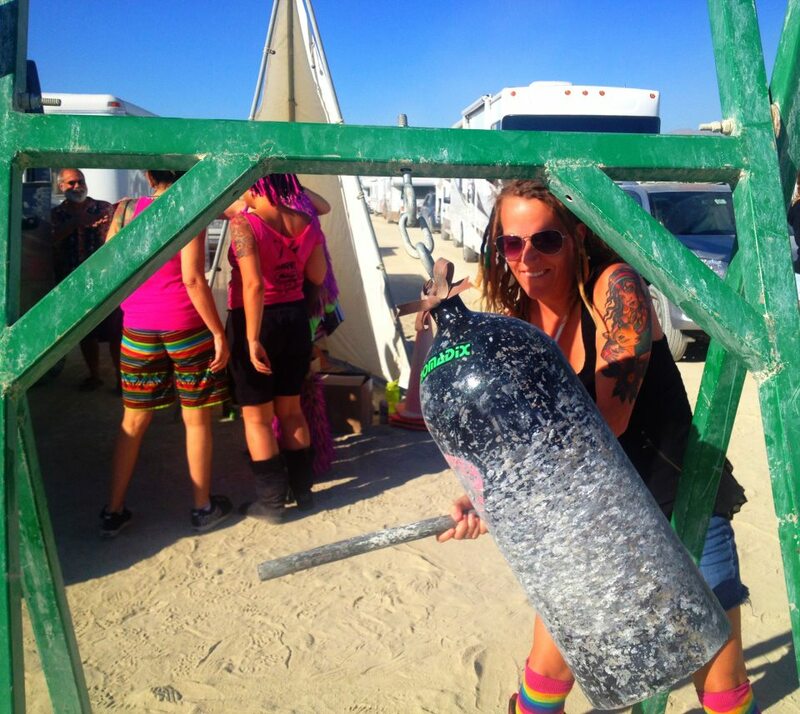 I hit my wall on the playa! Felt like a rite of passage. In the middle of my giant emotional/physical wall, I found myself in a pretty big argument with a good friend. We worked through it. Came out stronger. Better. Many mornings on my way back from my first trip to the porta potties, I'd slip into a dome across the street (which was usually empty), climb onto the giant loop of rope secured from the top and swing for awhile (standing) in the cool breeze as I woke up and said hello to the day. The people I was with while watching marching bands at Center Camp. Bowling at night in the middle of the desert. Meeting a couple sitting at the lanes who had both lost the people they were hanging out with. Finding themselves in the same predicament, they decided to make it their first date. It began by watching "The Big Lebowski" together, which was playing on the screens at the bowling lanes ... out in the middle of ... nothing. Looking at a man taking a picture of two women in beautiful Victorian dresses. Commenting on how gorgeous they looked and the photographer looking at me and asking, "May I hug you?" Our hug turned into a giant group hug of all these wonderful people. 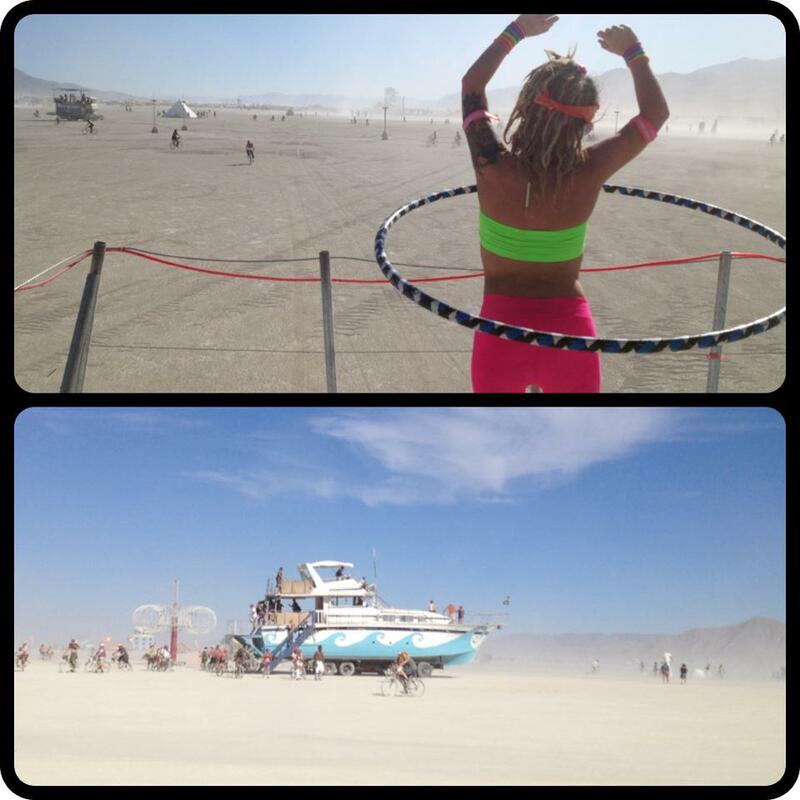 Hooping on the stern of a giant yacht driving across the playa. Making coffee every morning and then gifting it to whomever. Always taking some of that hot coffee over to my neighbors, some who were 40 years my senior, and chatting about life and love and religion. Buzz, who likes to give out random playa names to everyone he meets. "They're not GOOD playa names, but I can give you one." All around me people were being deemed things like "Firetruck" and "Ghost." He put his hand on top of my head, took a deep breath and declared me to be "Lube." Heh. Heh. While working at the Day Spa, having some neighbors walking through with afternoon hors d'oeuvres to love on all of us who were loving on others. 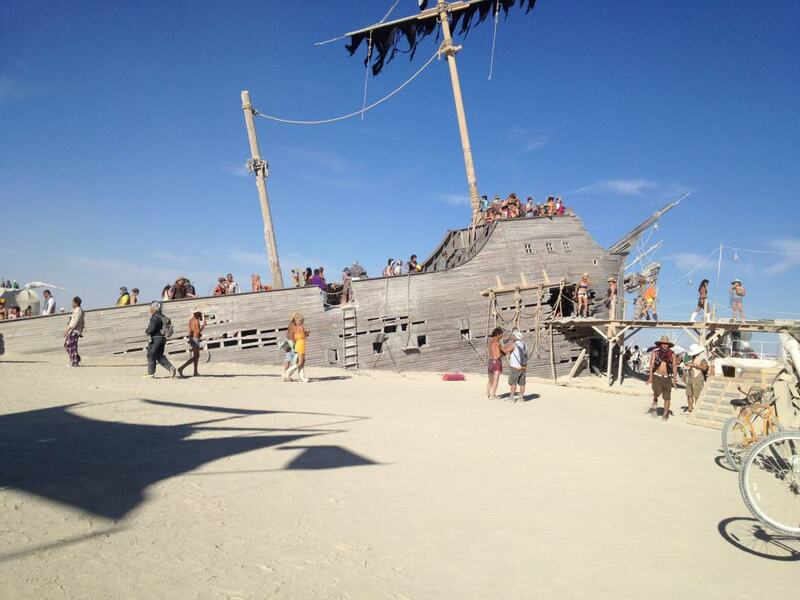 Playing on a huge shipwrecked vessel, lodged into ... the earth. We wanted to stop by one last time on our very last night. While looking out over the "waves" on the desert floor, created by lights, I heard someone right behind me say my name. Quietly. As if we were expecting to run into each other. It was J. We all talked for awhile, and before parting ways I wrote my blog address on his arm with a Sharpie (we're now FaceBook friends). 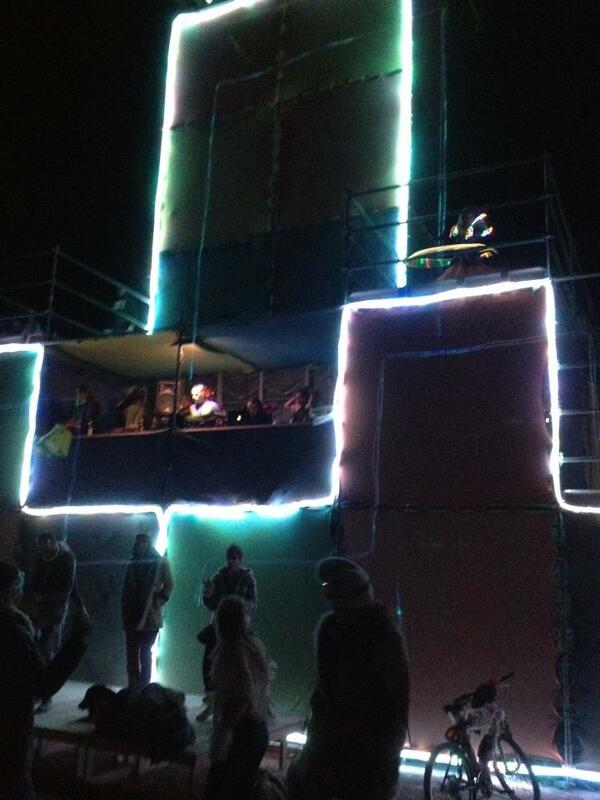 Watching the Man burn while on the top deck of one of our village's art cars. On each side of me were the guys who started Barbie Death Camp. One of them, who has burned for years and years, had his wife with him for the first time. She was sporting the bright pink polish I had done for her the day before. All of that, and it's still just the tip of the iceberg. You simply cannot explain all that it is, but thanks for letting me try. Angela, of course I know who you are! Many people were talking about Dye with Dignity. We were sad to miss the window to come dye with you. "Burning Man - It's the Darndest Thing"
Thank you so much for sharing. It sounds so amazing, and I don't even have anything close to compare it to, but my heart wants to...if that makes any sense. All I can think of is camping out at a big music festival or something, but I know that doesn't even touch it. Anywho, all that to say I was imagining everything as I read, and I am so glad you had the opportunity. This was my first year and your article had me laughing out loud and wanting to cry. Wow. It brought back so many memories, and made me miss it more than ever. Thank you so much for sharing this. Its beautiful. I'm sending my oldest daughter to your 366 costumes blog. She's gonna' FLIP. It's so amazing.